I upped my Netflix plan this month, thinking that I’d get all of the movies I’ve signed up to watch for the Everything Austen Challenge out of the way quick-like, and then settle down to read the books. This also seems like a sensible plan at the moment because I have over twenty novels out from the public library alone, not to mention the titles I own and haven’t gotten to yet. So last night I watched (translation: made myself sit still through, no negative connotation intended) the 2007 BBC made-for-television movie version of Persuasion. First off, Persuasion is one of my favorite books of all time, and straight-up my favorite Austen. I own the 1995 film version with Amanda Root and Ciarán Hinds, and I tend to re-read the book about once a year. I’m not sure I can explain its appeal, but I’ve always been drawn to characters who have a rich inner life without being self-absorbed or withdrawn, and I think Austen does a wonderful job of satirizing society and the foibles of love and family expectation in this novel. But on to the movie! Brief description: Anne (played by Sally Hawkins) and Captain Wentworth (played by Rupert Penry-Jones) were once engaged, but Anne was persuaded by a family friend to end the alliance, he took off, and we’re now at nine years later. Captain Wentworth enters the scene again, but is decidedly NOT looking at Anne for his matrimonial hopes. Chaos ensues. Things I liked: Sir Walter Elliot (Anne’s father) is suitably arrogant and annoying. He’s great, stays true to the Austen character, and is very convincing as a vain, self-obsessed popinjay of an aristocrat. Mary (Anne’s younger sister) is a credible hypochondriac in this film version. 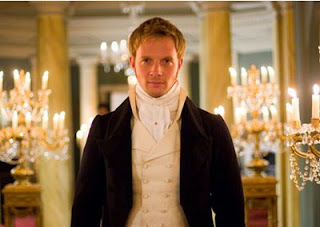 And Rupert Penry-Jones as Captain Wentworth…**sigh**. He’s gorgeous, and he does a decent job of playing Wentworth to boot. I had a déjà vu moment when he appeared on screen…I thought, I KNOW this guy! What movie is he from? Courtesy of imdb.com, I found that he plays one of the love interests in Charlotte Gray, my favorite movie of all time. +10 points for that connection! Things I didn’t like: While I mentioned above that Mary (Amanda Hale) is a believable hypochondriac, that’s the only thing I liked about her character and the actress’ performance. For most of the film Hale’s acting was so overdone that it was difficult to watch. I also thought that the early scenes in which Anne and Wentworth become re-acquainted were almost too fraught with emotion. And finally, this Anne was a bit of a crybaby. Granted, she was the one on screen 2/3 of the time, and you want a variety of emotion, but the little half-sobs and frowns of shock were slightly irritating. All in all, I give it a C+. Okay, but not going on my movie shelf. Yes, this version was pretty well done, but mainly due to the dashing good looks of Capt Wentworth! I still prefer the 1995 version in substance. I really have to watch more Jane Austen movies. I'm enjoying everyone's reviews for this challenge. Persuasion is my favorite Jane Austen novel... Good luck with the challenge! I have never seen an Austen movie! I just resigned netflix and Persuasion is instant play, maybe tonight. Awesome review! I love Rupert Penry-Jones. Him in an Austen film is definitely too amazing to miss :D Thanks for the great review! This is the one Jane Austen movie adaptation that I haven't yet watched. Thanks for the thorough review. Remind me on Friday to give you some books to give away. it was my first watching of this version too and i agree that it was a bit lacking apart from captain wentworth, of course. i'm gonna have to view charlotte gray -- for rupert! I'm so with you -- Persuasion is my fave Austen book too! (Sorry P&P, I do love you, just not as much!) Which is funny because of all the Austen books, I think this one has the least amount of stuff that actually goes on. But you are right; this book is much more about their inner lives. I highly recommend Captain Wentworth's Diary by Amanda Grange, if you haven't read it yet. So far it's hands-down the best of her hero diary series that I've read. I love the Ciaran version of the film (ohhhh he is a good Wentworth) and I'm interested to see the new version to compare the two. I have a feeling I won't like it quite as well -- there was just no need to mess with perfection -- but it would be fun all the same. And I will be annoyed too if Anne is overly weepy. Amanda Root's performance was spot-on; Anne is a character who takes all the crap her family dishes out, and she never feels sorry for herself, never develops a victim complex over it. It's one of the things I admire so much about the book. Thanks for the review! I'm re-watching this one for the challenge as well. I enjoyed this one, but I do like the earlier version better! Great review! I am also a big fan of Persuasion and have read the book many times. I love Pride and Prejudice, but I think Persuasion is either tied with it or wins as my favorite Austen novel of all time. I agree with Nicole - Captain Wentworth's Diary is fantastic!